August is slowly slipping away from us, and here in Minnesota it’s brought endless days of cool weather and rain. Baking has been an essential part of my day, as I process changes: new routines about to begin, weather moving from hot to cold, and daily current events that fill my computer screen. Stone fruits are still front and center at my grocery store; they’ve replaced the piles of berries that filled my fridge all through July. While we’ve mostly been eating them perfectly ripe and sliced, I did sneak in an up-side down brioche this week that was incredibly delicious. Made with plums, some butter and sugar, and a splash of vanilla, it’s a perfect way to celebrated the end of summer. There are so many good things about Thanksgiving dinner. There is the table piled with comfort food, the house full with family and friends, the first evening of holiday music playing, and a day to consider all the good things the year has brought. There is something to be said, however, about Thanksgiving breakfast. It’s always overlooked, and often skipped while one focuses on cleaning house, peeling potatoes, and setting the table. But what better way to start a day of feasting, really. 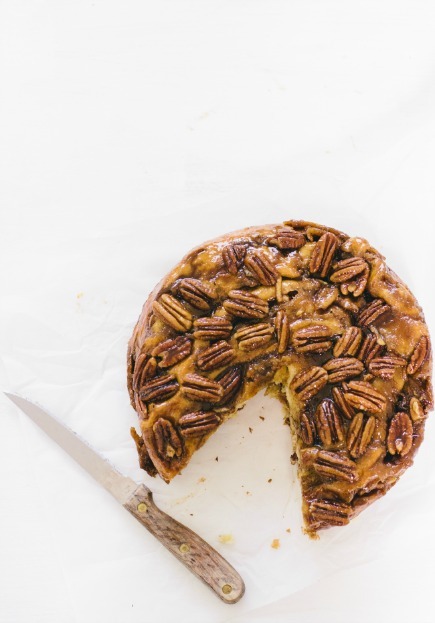 This cake is one big roll, stuffed with apples and topped with caramel sauce and toasted pecans. It’s perfect to have on hand for overnight guests and bribing kids to pitch in Thursday morning. It also just may remind one to pause with gratitude; this treat is still bread underneath. Breaking it with a loved one first thing in the morning is a sweet sort of communion, a unique way to stop and give thanks. One of the best indicators that spring is finally here to stay is when my rhubarb plant finally pops above the ground. It is incredibly faithful; no matter how cold the winter was, it never fails to grow again each May. Right now it is out-of-control, as the towering green leaves threaten to take over my entire garden. 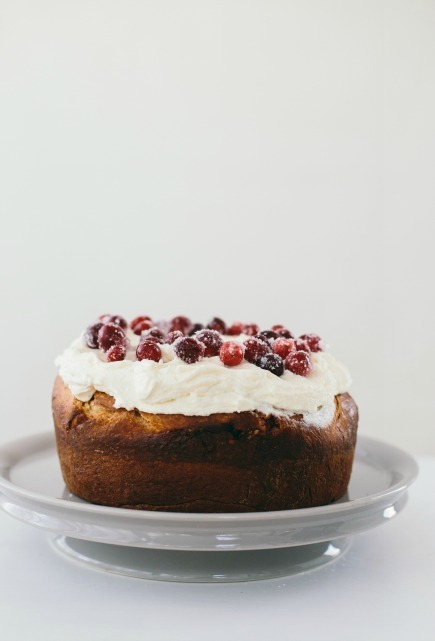 I’ve been looking for new ways to cook and bake with it, and was intrigued by several rhubarb upside-down cakes I spotted on Pinterest. However, I had a bucket of brioche in my fridge, so instead of mixing up cake batter I simply rolled out my dough and placed it over hot rhubarb and sugar. 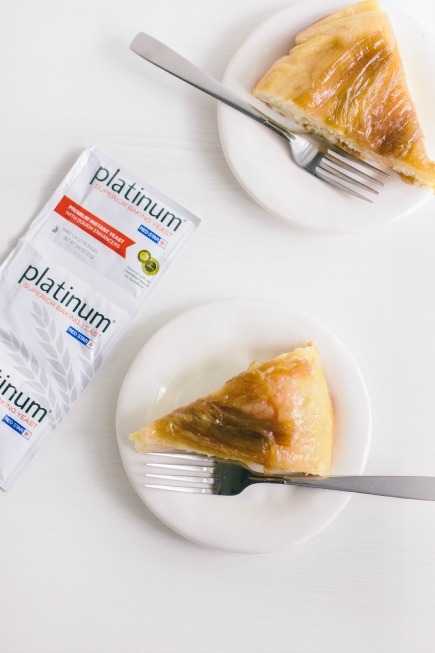 It was a success: a sweet-tart treat perfect for breakfast, or afternoon snacking. Don’t adjust the color balance on your monitor, this “cake” really is purple, green and gold. 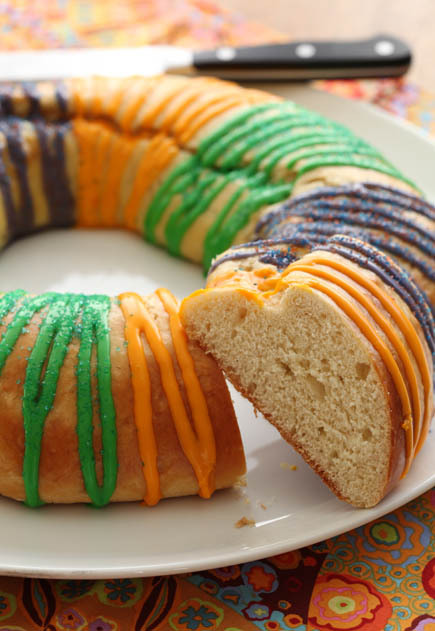 King Cake, named for the three kings who came to bring gifts to Jesus, is traditionally served during Mardi Gras in New Orleans and throughout the South. Not only is it decorated with the colors of the festival, but it also has a hidden trinket in the dough. I’ve used an almond, but in New Orleans bakers often use a ceramic or plastic doll to represent the baby Jesus. The person who gets the slice with the trinket is responsible for making the King Cake the following year.